Jawa Motorcycles India dealership details are here! Here is the final list of Jawa Motorcycles dealerships in India. The first set of showrooms have come up in Pune and Bengaluru. Jawa Motorcycles has launched 3 new motorcycles in India. While the original Jawa has come back, it bought Jawa 42 and Jawa Perak along with it. However, Perak will be available in the market after some months. While the new Jawa is an identical revival of the original Jawa, Jawa 42 is a modern classic roadster, based on the new Jawa. Perak is a Bobber motorcycle, made through factory customs. The bookings for both the bikes have begun at a token of Rs 5,000. At the launch event, Jawa Motorcycles confirmed that 105 dealers are set across the country. 64 dealerships have already commenced the process and development of showrooms. The first Jawa Motorcycles dealership has opened up in Chinchwad PCMC. The second one in Pune has opened up in Baner. In Bengaluru, the dealerships are opening up in Rajajinagar, Koramangala and Basavanagudi. These Jawa Motorcycles dealerships will come in the first phase. In the second phase, dealerships would come up in other metro cities. 5 dealerships for Bengaluru, 4 dealerships for Chennai and one for Kolkata are reported to be appointed. 1 dealership for East and North Eastern cities, seems a bit bad. Jawa is based on the first Jawa that came to India and it resembles the original one. The new motorcycle gets round headlamps, bulbous fuel tank with Jawa Inscription, the maroon colour, twin-pea shooter exhausts and single mono-pod instrument cluster. All these traits are carried over from the original Jawa. On the other hand, Jawa 42 is a modern version of this. It gets modern matte finish colours, modern touches, a revised instrument cluster and different style of rearview mirrors. Both the bikes use the same 293cc liquid cooled engine. The engine produces 27 BHP and 28 Nm of peak torque. Both the bikes pair up with a 6-speed transmission. The engine comes with a flat torque curve, which offers generous amounts of torque in the mid-range. 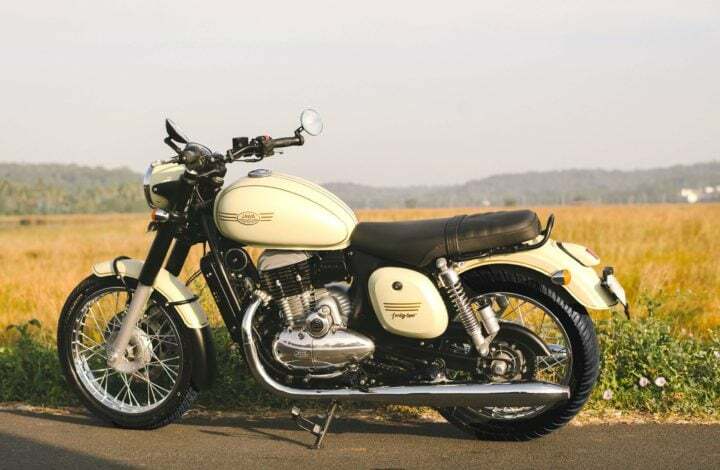 The Jawa comes at a price of Rs 1.64 Lakhs and Type 42 goes out for Rs 1.55 Lakhs. Perak gets a bigger 334cc engine that puts out 31 BHP and 31 Nm of torque. Since it is a factory custom motorcycle, it will be launched later. Perak is priced at Rs 1.89 Lakhs (all prices ex-showroom) and is the cheapest Bobber in town.